Brancaster discussion in progress, 10th April 2017. Photo John Pollard. Film of the discussions will be made available to view on the Brancaster Chronicles website (Branchron.com) shortly. I paid my first visit to Maritime Greenwich in 2010. I was in my first year of art school, aspiring towards figuration and rather disinclined to pay much attention to abstract art at all. Turner was my favourite artist, and so I was rather drawn towards seeing some of the world he depicted. The uniform that Nelson died in after his wounding at Trafalgar is particularly resonant in my mind. It is hard to reflect, almost impossible in some ways, on how we get to where we are. How many moments are there along the way that lead us to change course so drastically, for we hardly seem to notice it as it happens. Some may say that the divide between Turner and abstract art is not such a huge leap. Well it certainly feels so in reflection. If we fast forward seven years, my reason for returning to Greenwich couldn’t really feel more disparate. Having said that, if one was to visit the Brancaster Chronicles website, and if they were to scroll through the archive, which is forty-four chronicles and counting, one would probably have to assume that no one within Brancaster could have predicted just where their work and interests were headed when it all began in 2013. The sense I get is of a kind of shift in thinking about abstract art. It is a shift towards greater freedom, yet at the same time a tighter and more intensive focus. For me the artist who best illustrates this is John Bunker. To go back through Bunker’s Brancaster archive is to see an enormous range of experimentation that as the years have gone by, has shed a lot of tropes and baggage, but not in favour of any kind of distilled minimal purity, but a more complex, multi-directional expressivity. Focused but not always successful at integrating some of the more literal elements like bits of rope or old frames, I’m not sure to what extent it was Bunker’s intention in his older work to make those elements disappear at all, and surrender themselves to some sort of higher calling, that being the complex inner workings of the collage in question, as indeed these elements do now. Bunker now sits on a very special perch in my mind, as one of the most exciting artists I’m aware of today. I find him exciting, because he always keeps me guessing, and just when I think he has taken his work about as far as he can go, he goes one further again, and makes me doubt the previous batch of work that I had been so very convinced by (if you look at his twitter feed he is already at it again). The two works by Bunker that I have been able to see during my stay in London, are already moving on from and addressing so many of the problems that arose out of his previous individual Brancaster, which was and I think still is an extremely successful body of work. Not that Bunker’s Rumleskaft (showing at Greenwich) did not throw some googlies into the mix. Unlike Umwelt, which was showing in the recent Testing 1<2<1<2 that Bunker curated at Unit 3 projects, and unlike all the works he exhibited in his previous Brancaster, Rumleskaft is presented in a white frame and suspended in Perspex, making the wall it hangs on visible behind it, and casting a shadow as it levitates in front of it. It is actually very beautiful, but possibly a distraction from the real content of Bunker’s work, and this show was not without its supply of similarly distracting elements, which I will address in turn. But to pay Bunker’s collage the respect it deserves, it is a work made up of all the necessary elements, and yet it is totally unconventional. It has great colour, but what does that say about it really? It has unique texture, but it is a collage after all. It has somehow made me want to bypass any inclination I may have had to unpack it in this sort of way. For me, one of the triumphs of this work, when you compare it to the ones from the previous round of Brancasters, is the way the edge of the total shape doesn’t create any sort of secondary figurative imagery. There is no silhouetting going on, and I think that has to be a result of the complexity gathering right out at the edges and not gravitating towards the middle. I think there was some pressure put on John to attempt this last year, but then he had to pull it off, didn’t he? If I may be permitted to draw some conclusions based on what he himself said at the Heritage Gallery in Greenwich, I think his approach to his elements, and how they meet the edge, manifests itself in the work. If you are not worried by the edge, the forms will just fall naturally around it, and almost by default, work to counter the potential reading of unintended figurative imagery in the outline of the whole thing, because it has been less preconceived. Aside from the frame, there was one issue I had with Rumleskaft, but it is perhaps not even worth pointing out. It concerned the small pink inverted tear drop shape that sits on top of the interrupted yellow triangle towards the left of the collage. I just found it a bit distracting. This may or may not matter, and these things often disappear with time. I found it appropriate that Bunker’s collage should be hung in eye line with and above Robin Greenwood’s Insignia, a steel sculpture incorporating wood. I’m yet to understand exactly what the commonality is between their work, and perhaps there oughtn’t to be. Nevertheless, there is something in the accumulation of bits, and what they add up to, and there is a certain boldness of character to the collage and the sculpture. There was always going to be a bit of a test involved in exhibiting Insignia, not just for Greenwood, who would be eager to see how the introduction of wood is received, but also for us, the collective viewer. Can we incorporate the wood? Can we integrate it, accept it and move on to more important questions? To be frank, I don’t know if we did come to grips with what the wood brought into the equation. It brings variety to an already varied articulation of steel, so it was not out of place in that sense. I suppose the lurking question for me was, if you are going to add wood to the mix, are you doing so because you want it to set up some kind of contrast, an added complexity perhaps? 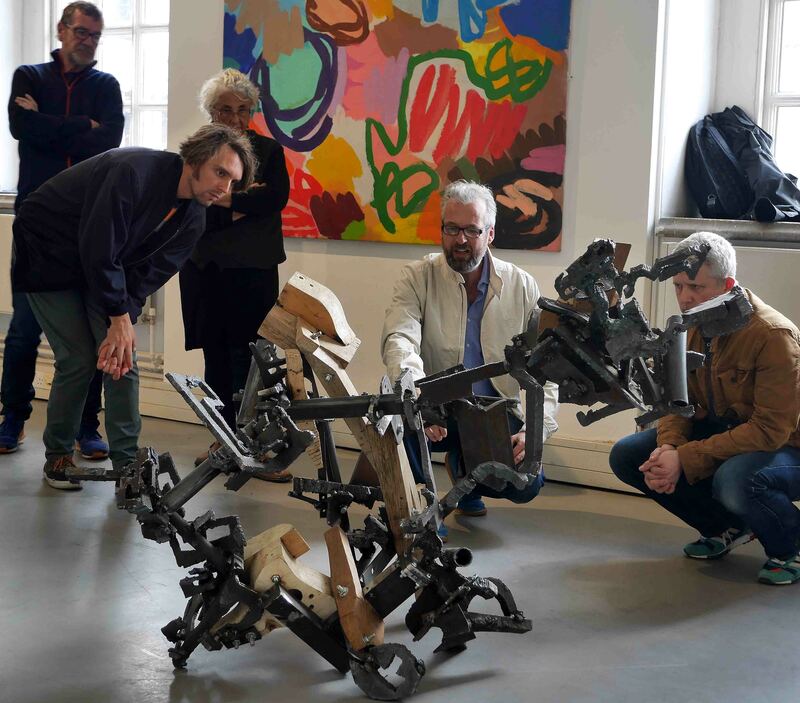 The trouble is, you don’t want the content to merely be that comparison, so the wood, like the found elements in a Bunker collage, but really like any material, be it paint, steel or bronze, to some extent has to be able to shed itself of its literal identity. That seems to me like a valid enough aim for abstract art to take on. I think the way to do that is through complexity, and Greenwood’s work has that in spades. It also seems to reflect what I’m detecting across people’s work and in their words, an ambition to challenge prevailing notions of wholeness, or at least give it some serious, perhaps overdue scrutiny. But another thing I found the wood to be doing, was it made the sculpture feel quite complete, even quite full in areas. I might be completely wrong here, but it was adding a certain kind of volume or density to the steel, maybe even denying any sense that the metal is merely “drawing in space”. Insignia at first appears to set up these rather large spatial divides between three or so main clusters of activity, but this feeling dissipates dramatically with further looking, as each part runs into another with such visual enthusiasm, the wood giving moments of pause to what is a demanding work. All this work is demanding in its own way, but of the pictorial work I felt most challenged personally by Hilde Skilton’s Sarah’s Tears and Emyr Williams’ Vibo. 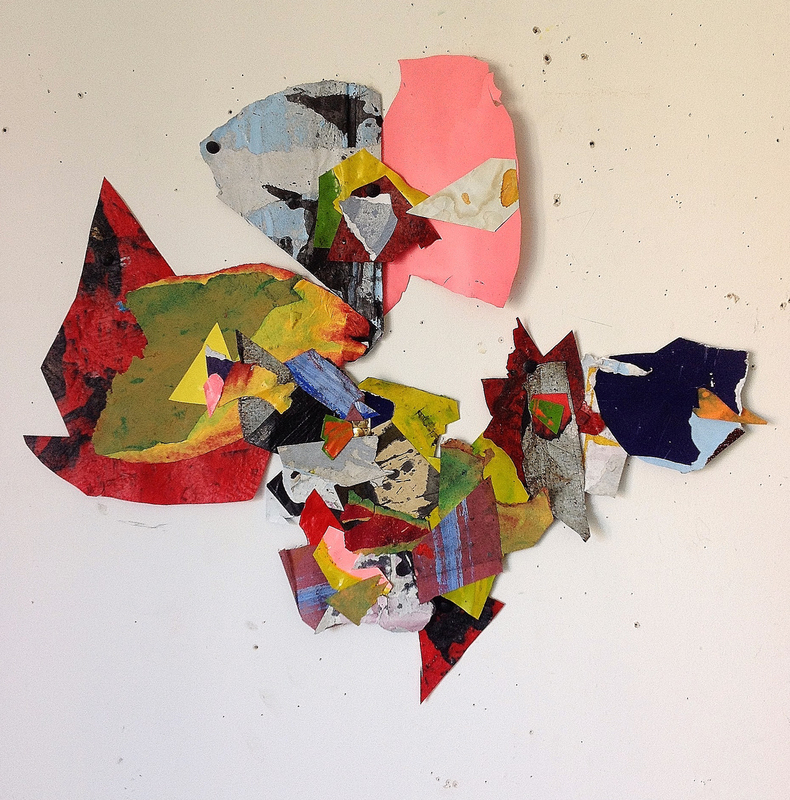 In the work of Anne Smart, John Pollard, even elements of John Bunker’s collage, I can recognise similar approaches to those I might employ, be it in application, density, colour strength and directional forces. Sarah’s Tears and Vibo were very unfamiliar to me, even though I have been aware of Skilton’s and Williams’ work. To begin with Vibo, it has a paint surface unlike any I have seen. In addition to the highly alluring matte quality, the acrylic paint in some parts seems to be interspersed with a sort of granular medium, perhaps a fine pumice, which made for a sugary sort of texture. I could almost hear the paint crackling as it was laid on. This might give the impression that the surface is rather built up. In a way it is, but yet it retains the immediacy as if it were done in one hit. 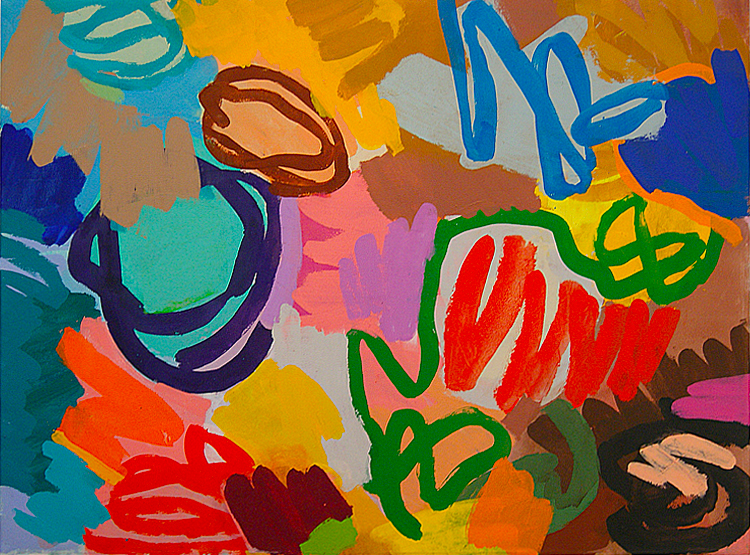 I can see where Williams has painted over shapes and colours, but the painting remains fresh and agile. This could also be said of Skilton’s piece too, but she applies the paint in more translucent washes, as opposed to Williams more advancing opacity. In Sarah’s Tears, darker colours can be observed underneath brighter washes running into neighbouring areas, whilst bright colour patches might stop short of running all the way into another, preserving the white of the canvas in some instances, like a sort of vibrating halo. Not one ‘area’ of colour is made up of a single flat hue. There are shadows and disturbances running throughout, the results of a fluid and changing structure where one colour over another creates something else again. The spaces move in and out of the picture, but I felt that it was as if the light itself was being modelled, not necessarily the forms it articulates. Because where are the forms in this painting? Everything seems to become part of something else. Sarah’s Tears is a challenging painting because it doesn’t give you the luxury of dwelling on questions of surface or the relatability of forms to something familiar and recognisable. It is a distraction-free work of art. It asks you to cut to the chase and consider those abstract qualities of light, space and movement. The forms themselves are almost beside the question, these selfless escorts for the eye. Not that Williams’ Vibo is in anyway inferior because the surface is more a part of its content, or because the forms or shapes are clearer, perhaps more determined than in Sarah’s Tears. In a way, Williams is not setting total store by form either, because I do not find the linear strokes or broader shapes over-engineered. The right balance has to be found to allow them to get us into the colour. But it’s a complex business this. You cannot dismiss the importance of these shapes to the overall feel and structure of the painting. But it has been observed and I agree, that the shapes in Vibo, are less motif-like than some other forms previously employed by Williams. Colour is the key for Williams. He has made this abundantly clear, and for me it could explain the use of motif as a vehicle for colour, but it could equally explain the act of expanding and dissolving the motif to further emphasise the role of colour. And the colour in this painting is actually quite subdued. There are lots of colours, some quite bright, but also tinted, and even checked and mediated by a range of different browns. It is a testament to his knowledge and ability that with all this variety, nothing jumps out or dominates your vision. But nor is it flat, or relying on a sort of equal all-overness. You can read bright colours as being further back, like the turquoise (middle left), with a tinted umber coming in over the top of it (quite unusual in itself). And yet if you go to look at the pink form to its right, the one hemmed in by the lilacs, the turquoise has reasserted itself again. The spaces are not fixed, but on the move depending on where your eye rests. It seems appropriate to stress that this is not optical but visual. It is about free movement, whereas optics produce the same effect each time, often in the same way for every viewer. In Anne Smart’s previous individual Chronicle, there was some debate in front of the work and later in the comments section of the website about effects, and whether or not there is a greying effect at play in some of her paintings, not dissimilar to pointillism. The point (if you’ll excuse the pun) was not that the work itself was at all pointillist in theory or application, but that there was a similar result happening, in that pure hues placed in close proximity mediate each other and create another colour from a distance. In the case of Smart’s paintings, which have increased in colour at the expense of white in recent times, the colours were said to not be holding from a distance and becoming a kind of grey. I did not experience this at the Heritage gallery. I didn’t think the colour was the same from a distance as up close, but it remained strong and clear. From a distance, I was more aware of the reds and crimsons and yellows forming more prominent fields, and up close I became quite aware of the blues and blacks, and their intertwining with the warmer colours, which is to say nothing of the incredible surface and attention to detail, which isn’t really something associated with abstract painting, and so unique for that reason at the very least. 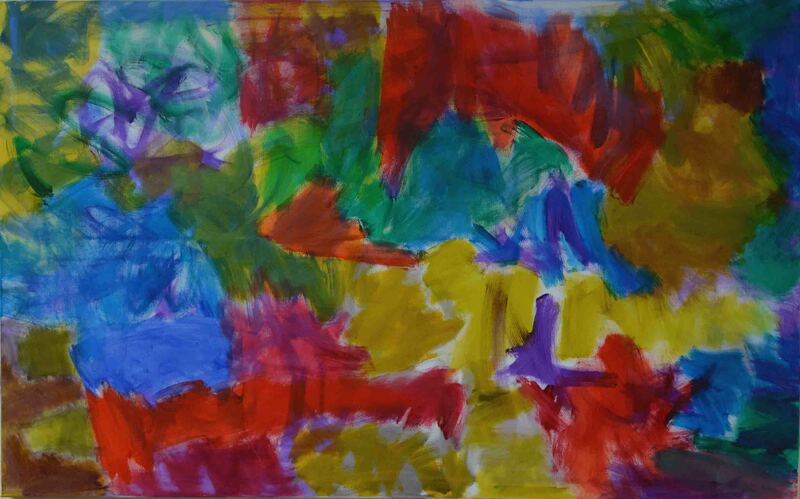 Obviously there has been a lot of ‘detailed abstract painting’, but it is often quite contrived and gratuitous. The paint is paint in Smart’s Some Light. It is present, it is there, it is itself, and there is a wealth of it. It’s a real treasure trove of a painting. It’s juicy and fresh, and despite the presence of the paint, it is not impasto, it is never heavy. Another thing this painting is served well by is the scraping back into the paint, quite like drawing in a way. It appears to articulate subtle pieces of information, that can then be read as distinct things without any recourse to figuration whatsoever. They do not define these parts, as that would be too prescriptive, but they create some loose divisions and variety that can separate all this stuff and stop it from being swallowed up by a kind of all-over field. It is then up to us to decide which way we want to go, and how to connect all these things together. I think there is now a shift happening in abstract art in the way that we think about the balance between wholeness and the potential gains of putting ‘things’ in to a work. Another serious debate within Brancaster that continues to cause some collision is the issue of the plinth versus the floor. 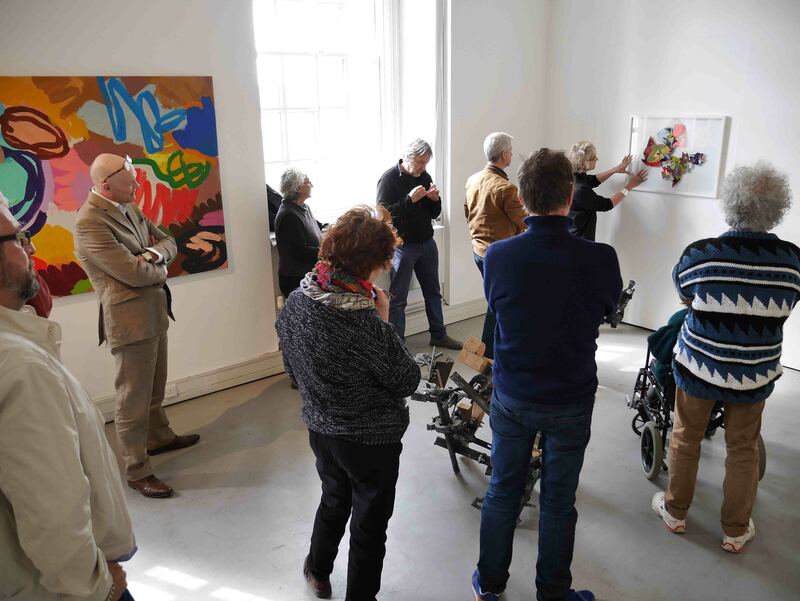 I imagine that we would usually be seeing Mark Skilton’s work positioned on the ground, larger and more directly involved in our bodily space. 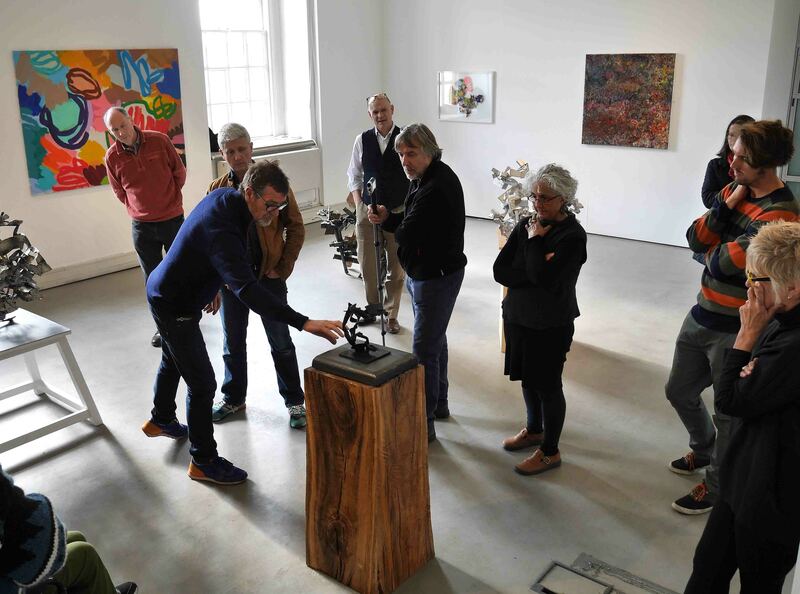 Due to weight restrictions on the floor at the Heritage gallery, Skilton has adapted to this problem by showing a smaller aluminium sculpture on a plinth. I hope that this didn’t feel like too much of a compromise or a diversion from his usual project, but then I do not know whether smaller aluminium sculptures are a regular fixture or not in Skilton’s output. But when you do consider Skilton’s work in previous Brancasters, and comments such as this, that “…abstraction can be freed up by getting rid of functionality in all of its manifestations, not just structural but also compositional…”, it does make you wonder about the plinth, and whether or not it is ideal for him. Of the four sculptures in this show, three are on plinths, the other two being Alexandra Harley’s Kintinkiri and Tony Smart’s Untitled, both artists not seeming to have a problem with the plinth, so it is perhaps more curious in Skilton’s case. That said, I didn’t really take too much notice of it, unlike Harley’s plinth, which is itself a much more beautiful object, and for that reason begs you to consider its relationship to the bronze that sits atop. But I don’t want to dwell on the plinths. There is a debate to be had, but perhaps not in the context of a show consisting of nine artists. I thought Skilton’s Vivacious Viper was quite well served by the bubbling nature of the welds. 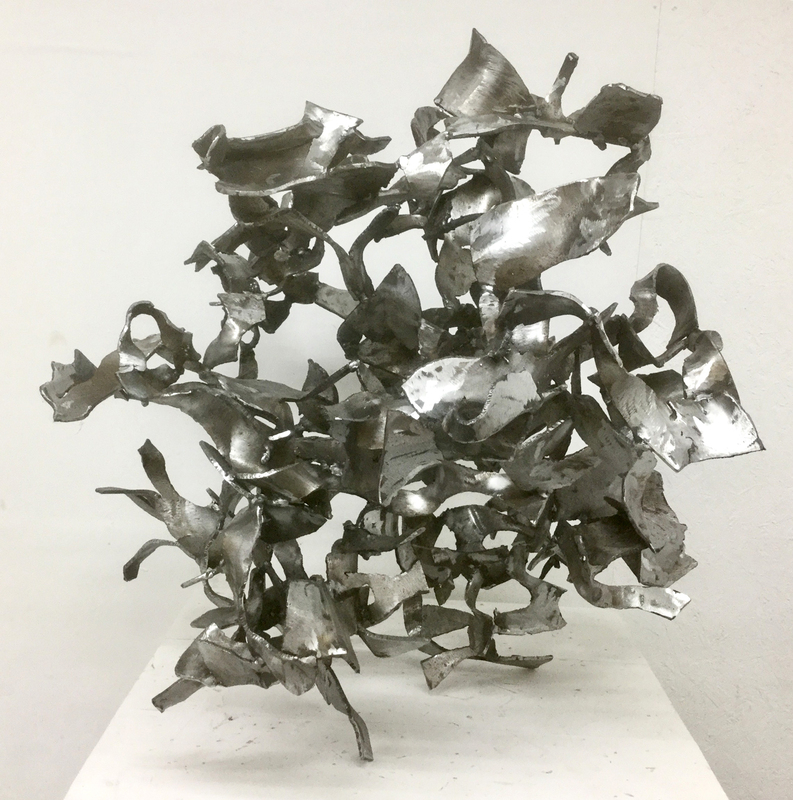 In this bright and slightly reflective surface, built up of these crisp, hard-edged cube-like forms, the lumpiness of the welds may be saving this sculpture from becoming something too sleek. This sculpture felt fast to me, not in its making, but in how my eye travelled through it. The cuts of the aluminium and the texture of its surface, aside from the welds, is more uniform than in Greenwood’s Insignia and so you move through it quicker. That said, there are quite large portions of space to consider through the centre of the work, and surprises. The rising form that curls up over the rest of the sculpture for instance, at first glance appears to reconnect and touch what is underneath it, but instead stops short and hovers above. The relative distances between things in this work, and the degree of uniformity to the aluminium, suggested to me that Skilton in this work was thinking more about spatial articulation in Vivacious Viper than about the physicality of the material. Tony Smart’s sculpture, for all the density of information, has at least two, large, almost head-sized openings of space, one at the base of the sculpture, the other higher up and facing the entrance to the gallery. These massive openings in a way start to disturb what I saw at first as a kind of orb. Some parts protrude out more from the main cluster of information, and almost gives it a sort of leaning stance from some angles. 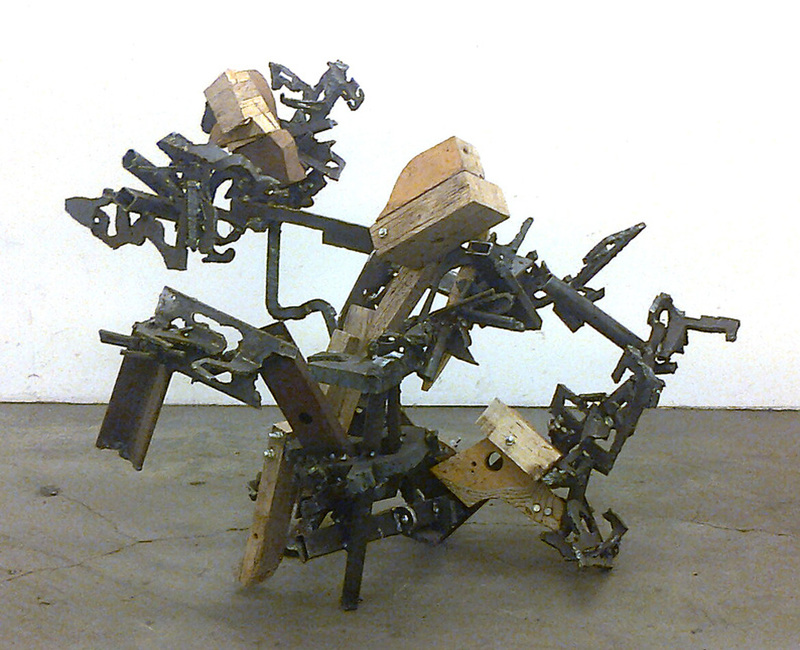 But these bits always return, beautifully twisting and reconnecting with another element, constantly sending you back into the sculpture. It is quite an illusory sort of work. Even with the plinth, I was rarely taken out of the sculpture. This wasn’t quite what I had expected to see from Smart, but great artists keep you guessing. I had perhaps expected more of a sort of reaching out into space, and less steelwork, making the information more clearly visible through to the other side. But is that necessary? I am starting to wonder whether in some ways, the sculptors in Brancaster are starting to explore something of a return to density, whilst continuing to pursue greater three-dimensionality. 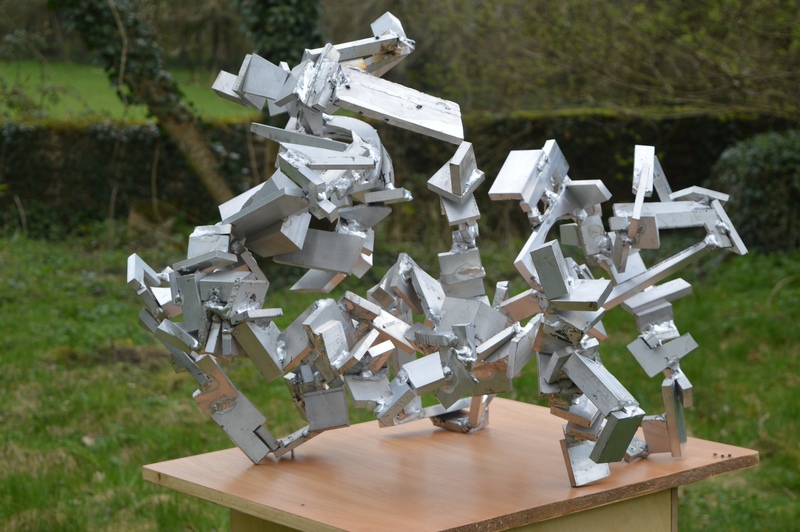 Does greater three-dimensionality have to allow us to see all parts of the sculpture at once? As has often been the case with Brancaster, we shall keenly watch this space, eager to see where things go from here. There are parts to Alexandra Harley’s Kintinkiri, that only reveal themselves from certain vantage points. Quite an intriguing achievement for such a small and relatively simple sculpture. It was remarked by John Pollard at the talk, that Kintinkiri’s character or sculptural identity changes from wherever you look at it, in a way that the other sculptures didn’t seem to be doing, that they retained their identity more from any angle. I think this is rather true. For instance, Kintinkiri is from some angles looks quite upright and elegant, and from others excitingly awkward as it leans and almost topples into invisibility. There are some really intelligent elongations and manipulations going on in the wax it was originally sculpted in. Some viewpoints will present us with what are like two long stems, rising up and twisting at a loose ninety-degree angle, and supporting these rather delicate, somewhat triangular, larger flatter shapes that fold up quite nicely in the corners. But by the time I had moved to the other side, I had been completely surprised by the revelation of an additional one of these flatter pieces, completely at one with what appears as a narrow stem from the opposite point of view. It was exciting. Another aspect I found quite interesting, was that this sculpture felt more figurative to me than the others, not in its structure and not because of the plinth, but because of the way the forms had been moulded and articulated in the wax before being cast in bronze. There was something more descriptive, more organic and more deliberate in a way. The forms were more volumetrically curved, as opposed to the flatter twisted steel in Smart, or the more angular physicality of Greenwood and Skilton’s. But I liked this as a point of distinction, and to think about different ways of being abstract. Is there something clichéd about likening abstraction to hard edges, or boxes, or flatness? Of course there is. So is it a challenge to some of these notions to go out of your way to describe and articulate form? Abstract sculpture doesn’t have the same dilemma as abstract painting when it comes to depicting space. Indeed, sculpture doesn’t depict space at all. It exists in it. But what happens to sculpture when the material is too manipulated? I think one of the things that connects the work in Brancaster the most, is not only elements of the approach to making and starting from nothing, but in the way the material remains itself without being literal, and looks to create illusion by way of inclusion, putting more of this stuff in and trying to clarify and make it all work together, without completely obliterating the nature of the material. In some ways Kintinkiri seemed to be running counter to that. 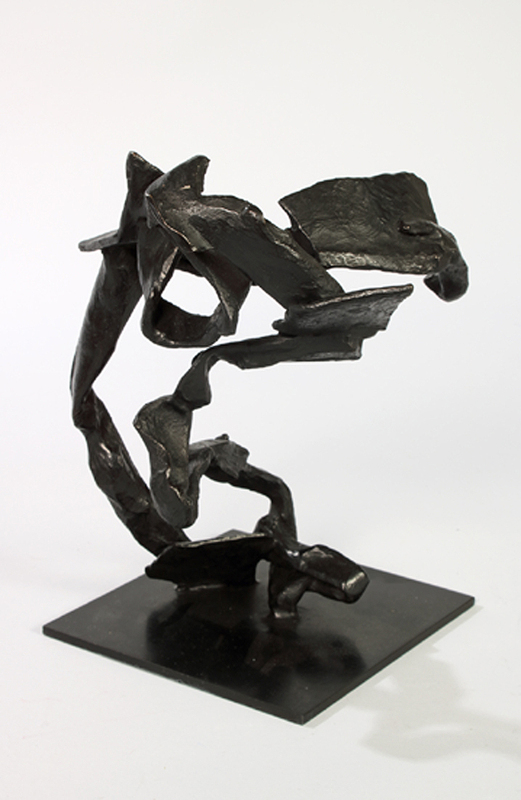 It was the most simple and perhaps the most precisely modelled and articulated, having also had to commit to a form before casting it and making it permanent in bronze. So even the process is quite distinct from the rest of Brancaster, once you get to the final stage at least. 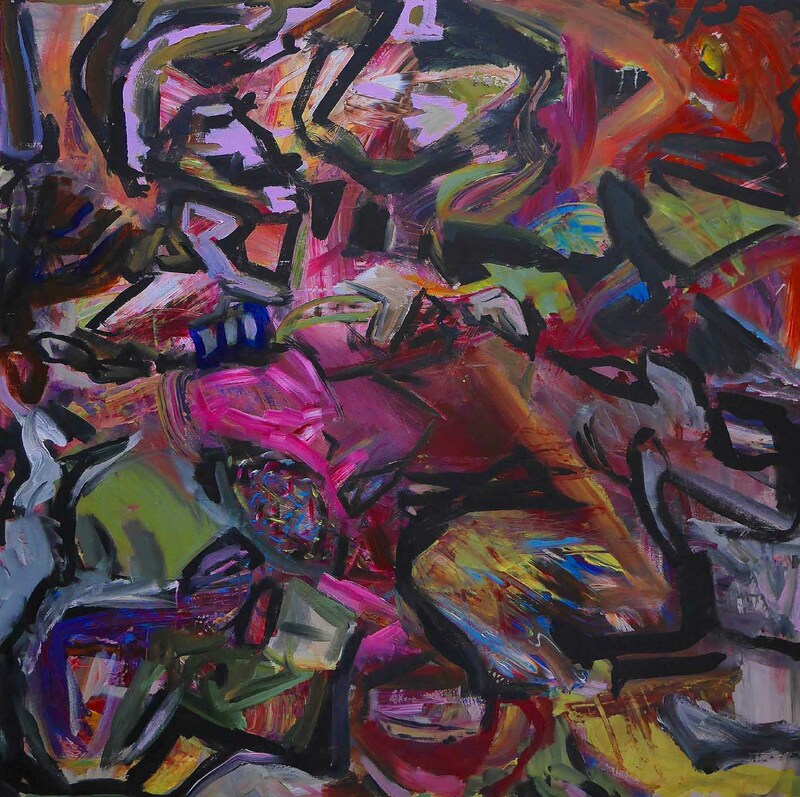 In Over the Overman by John Pollard there is also a challenge to traditional modes of creating space in abstract painting. Obviously it has colour, and the deep magentas or mauves are the ones that seem to permeate and resonate most strongly. It is a recessive hue, much more so than the pure blacks that are laid, almost drawn on over it. I get the feeling looking at this painting, that I am looking at a field of action that exists behind the plane of the canvas, and I think that is an extremely interesting thing for an abstract painting to be doing, if indeed it remains just that, an abstract painting. 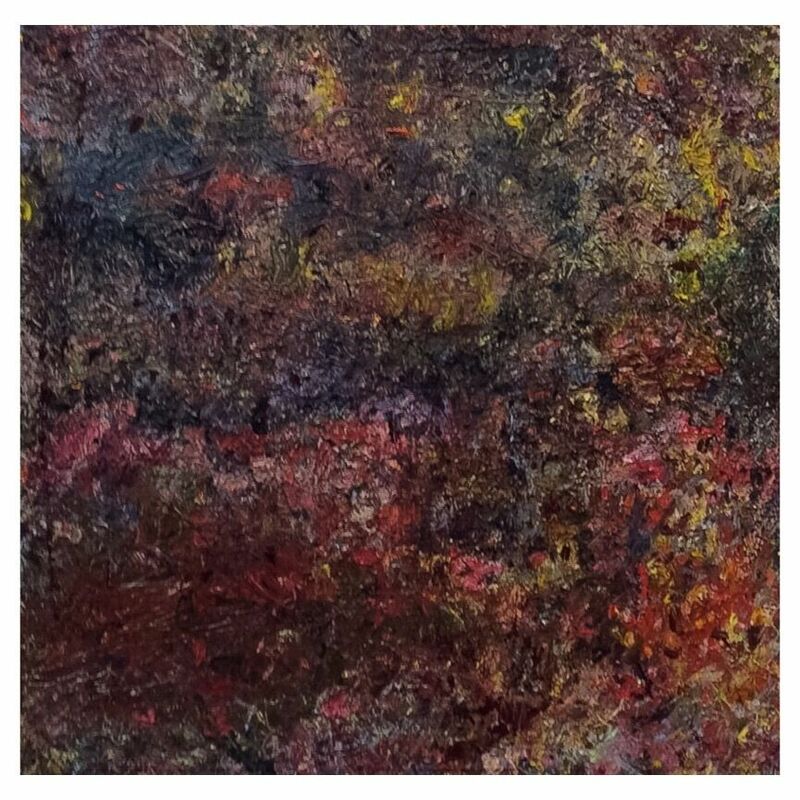 I was also detecting rather subtle uses of perspective in this painting, not only created by the black lines, particularly when placed on the diagonal, but also by the emergence of more clustering form like things at the top, creating a sort of advancing ceiling over the cavern of space in the deep purples. These perspectives are not definite. It would not register as an abstract painting if they were. But I feel they are there somehow, or at least creating enough of a division between forms, allowing for a bit of consideration before zapping off somewhere else in the painting, perhaps like Anne Smart’s scraping back into the paint. Busy paintings need this, I feel. There has to be some resistance to just skimming over the whole thing in a flash because there is nowhere to settle. If there was a part of this painting that bothered me, it was perhaps this small pink shape at the top edge of the canvas, sitting squarely in the middle. It seemed to jump out too much, and maybe if it did need to do this, it could have been somewhere less central. I wondered if its inclusion was too much of a conscious ploy to make the space at the top advance and seem further forward than the bottom, something worth considering for abstract painting in order to avoid feelings of landscape or groundedness. But you could do any amount of nit-picking with a painting of this nature. It’s casting its stone a long way out, I feel, and the potential gains of this sort of endeavour, to deny the plane in abstract painting, is something that could and has been guffawed at, but I think is a really interesting and worthwhile thing to attempt. I don’t think it will be possible to draw many conclusions from this show. It poses more questions really, and I haven’t even attempted to address the elephant in the room, and that is whether Brancaster Chronicles is well served by large group exhibitions of this nature. Is it to the purpose of Brancaster, which has been about steady personal progress as a product of intense and qualitative peer review? Nevertheless, I think this is a great show, full of work that ought to be seen. It was well worth the plane ticket. If Londoners can find the time to get to the Heritage Gallery in Greenwich before the show closes on the 20th, I recommend staying a while. Look hard, then look again. Anthony Smart, Harry Hay, Noela James, John Bunker, Emyr Williams discussing ‘Insignia’ by Robin Greenwood, with ‘Vibo’ by Emyr Williams in the background. All photos by John Pollard. 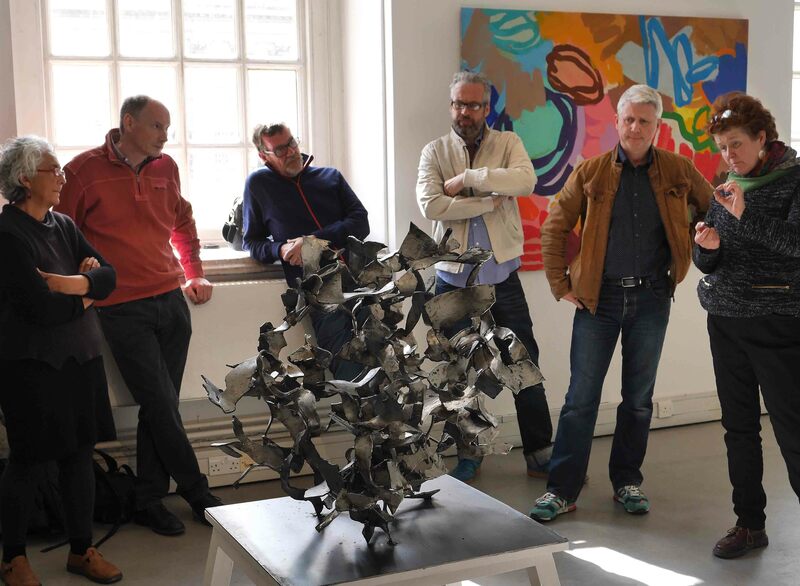 Noela James, Richard Ward, Anthony Smart, John Bunker, Emyr Williams and Alexandra Harley with Smart’s untitled sculpture. 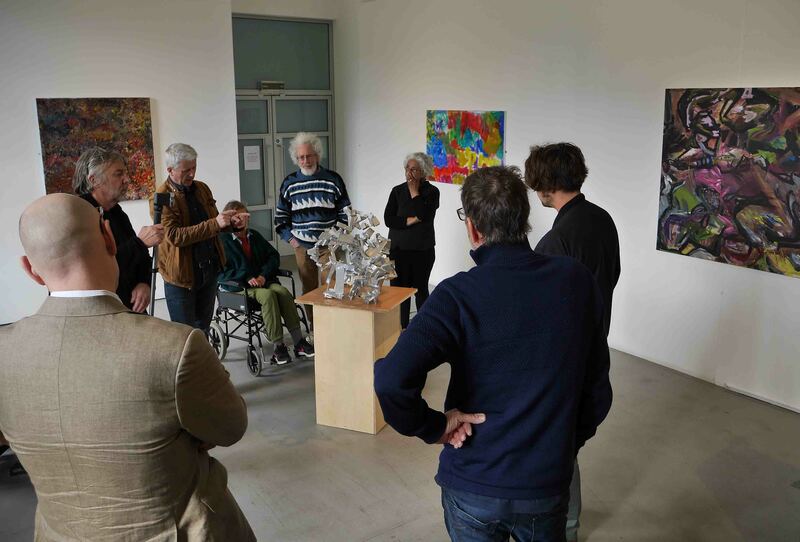 John Pluthero, Robin Greenwood, Emyr Williams, Hilde Skilton, Mark Skilton, Noela James, Anthony Smart and Harry Hay discuss Mark Skilton’s ‘Vivacious Viper’. Excellent review, full of insight. I agree with Noela, really good review, balanced and intelligent. More of that, please. Good luck Harry, and thank you for coming to see us.